Camouflage can become vitally important in two distinct survival situations. It can help you to avoid capture if you find yourself in a potentially hostile environment. It can also enable you to hunt animals more successfully which you might need to rely upon for food if you’re facing several days in a remote place with no immediate hope of rescue. 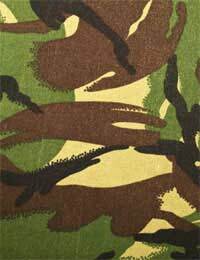 Most people are familiar with the standard green, brown and beige army style camouflage jackets that are familiar on the High Street but the art of good camouflage is to be able to adapt your camouflage methods to suit the terrain you’re in. For example, the army style jacket would give you no camouflage protection if you were stranded out on the Arctic. The other crucial point is that camouflage is not simply about what you wear but, depending upon your situation, you’re likely to also need to consider issues such as shine, shadow, noise, movement and scent. In a survival situation, you’re going to be located in a place which will have a very distinctive look about it depending upon its climate and terrain. It might be the Arctic in winter, a jungle in summer, a desert or even a swamp, for example. Therefore, when considering camouflage, it’s important that you modify your existing clothing to match the colours and textures surrounding you to enable you to blend in to the environment for the purpose of concealing yourself. The best way of doing this is to attach some of the vegetation to your clothing. Make sure you also do this for your boots, any hat or helmet you are wearing and any equipment you’re carrying as well as camouflaging your face and hands. If you’re buying camouflage gear to wear, make sure it matches the environment in which it’s going to be used. For example, beige slashes are more associated with the desert, blotches are used more in deciduous forests and the Arctic whilst broad slashes are used in the jungle or coniferous forest. There is more chance of your presence being discovered by an animal or the enemy due to factors you may have overlooked, no matter how well camouflaged you think you are. Shininess and shadows are two major giveaways. Anything that shines or gives off a reflection will give away your position. It’s not just the obvious things like binoculars, mirrors or glasses that you need to keep covered but even your face starts to give off a shine as you start to sweat and your skin becomes oily. Therefore, it’s important to re-apply your camouflage ‘make up’ regularly. Don’t forget things like belt buckles, jewellery, even the zip on your trousers and eyelets in your boots can all give off shine. Removing unnecessary shiny objects is your first priority but you can reduce shine by smearing mud onto reflective objects. Even if you wear glasses, for example, a light coating of dust on the outside of the lenses can reduce light reflection. You also need to be aware of shadows which is why you should try to stick to deeper vegetation if possible where it’s more difficult to cast a shadow. In more exposed areas, pay close attention to bright sunlight and how that affects shadows you cast as well as being careful hiding around corners of buildings where your shadow might be cast to the enemy or animal on the other side. Noise, movement and scent are all going to be other important considerations you need to take into account in addition to camouflage. You should move lightly and slowly to avoid making too much noise. Depending on your situation, you might also be able to move more quickly if you have other environmental elements on your side such as moving when winds are gusting or when trucks are passing by or planes are flying overhead. Also, stop occasionally, look around and listen. Whilst you’re moving, you’ll not be as tuned in to listening out for the movement of other people or animals as you can be when keeping perfectly still. Scent is another giveaway, particularly where tracking animals is concerned. In addition to always approaching from the downwind side, standing in smoke from a fire, smearing your skin with natural aromatic plant scents as opposed to using soap and cosmetics and chewing fresh herbs as oppose to using toothpaste can all help in making your human scent less noticeable. By having a good understanding of the terrain and environment you’re in and how to camouflage yourself, it could help to save your life. Remember, however, that as you cross different terrains, you’ll need to make regular adjustments to your camouflage garb to reflect the changes in surroundings.